Like Faber-Castell, Aristo was a company famed for its slide-rules. With the appearance of hand-held electronic calculators in the early 1970s, especially the Hewlett-Packard HP-35 with scientific functions, sales of slide-rules dropped dramatically, so Aristo started to manufacture electronic calculators themselves. It produced a series of calculators, many similarly smartly styled with slim casings. However, the company closed down in 1979, after the prices of electronic calculators had plummeted. Here are two typical models of Aristo electronic calculators. Distinctive features: One of the, distinctively styled, slim, hand-held electronic calculators manufactured in Germany by Aristo; a company famous for its slide-rules. 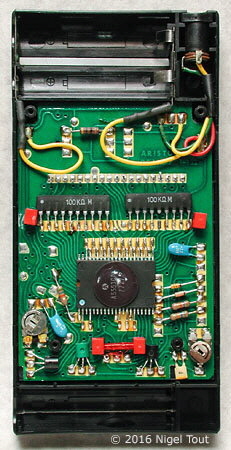 Main integrated circuit: Mostek MK5020A, here date coded early 1973 (though other ICs are date coded to late 1973). 62 x 150 x 18 mm. (2.4" x 5.9" x 0.7"). Supplied with a clear plastic snap-on cover. 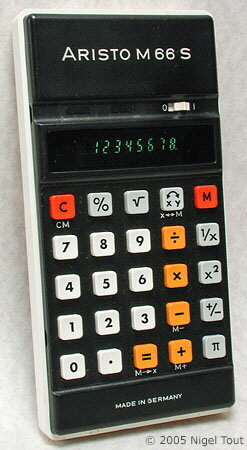 A later, higher specification, calculator with a similar styling manufactured by Aristo in about 1977. 8-digits, green VFD (Vacuum-Fluorescent Display) display. Main integrated circuit: Rockwell A5553CA, here date coded mid 1977. 76 x 151 x 18 mm. (3.0" x 5.9" x 0.7").